It is safe to say that kitchen cabinets these days serve various purposes and aren’t just for storage. 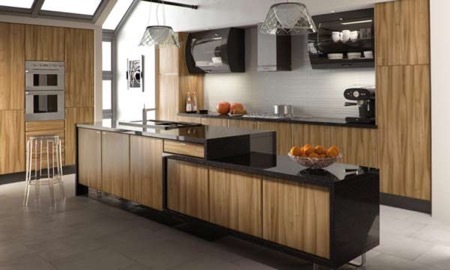 Modern-day people choose kitchen cabinetry that will fit their style and look equally stylish, fancy, and trendy. 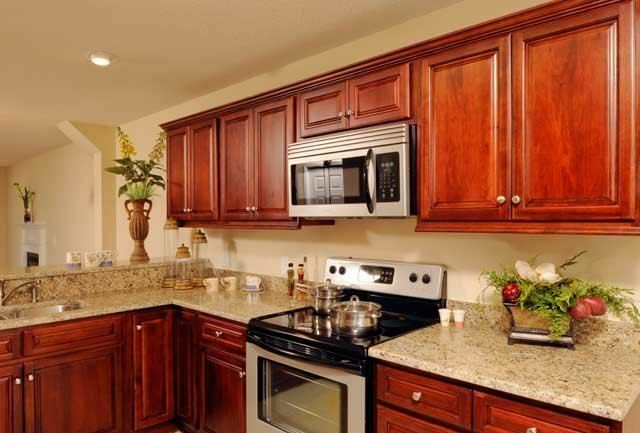 If you’re planning to do a remodeling of your kitchen, then walnut cabinets might be the essential element that will bring everything together and turn an average room into one that you can be proud of. Some people choose minimalism; others want something high-tech, something that will immediately attract attention. Walnut cabinets, in turn, are all about legacy, history, and class. 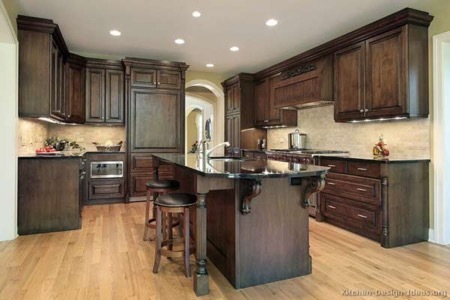 For example, black walnut cabinets will introduce a retro and “royal” element into your kitchen. Brown walnut is excellent as a neutral element of the interior: it will allow you to use something like stainless steel and glass to make the kitchen look bright and modern. Flexibility is what walnut is all about. True, it can also be quite pricey, but it’s definitely worth every single penny. Despite the somewhat vintage vibes, walnut goes surprisingly well with almost every single material out there. Today, we’ll take a look at 21 best walnut kitchen cabinets ideas for 2018 that will bring something new and intriguing into your house. Walnut Kitchen Cabinets – What Are They Good For? Before we go ahead and check out our top 21 cabinet ideas, let us talk a bit about the benefits of walnut. First of all, this material is known for durability and that classic, rich, “expensive” appearance. It’s worth mentioning that when it comes to custom kitchen cabinets, walnut is among the most popular and respected woods. That’s because it looks and feels amazing. As we said earlier, it doesn’t really matter what kind of décor you’re going for: walnut always finds a way to integrate itself into almost any style, be it modern, elegant, or classic. Those lines and the wavy texture make it look even more beautiful. Plus, walnut is a sturdy wood, which means it will serve you for many years, if not decades. Furthermore, walnut is a pretty lightweight wood and won’t be very hard to carry around and/or cut, which is a big problem with some other retro-style materials. 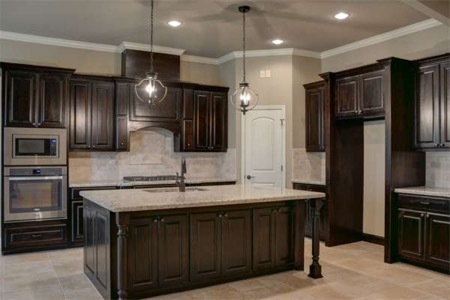 The dark, warm, luxurious look means these kitchen cabinets don’t need any staining. And, every single cabinet made out of walnut is unique (which is true for every tree in the world). Finally, it is 100% natural, and you won’t have to worry about the possible negative effects that it could have on you and your family over time. If you want to change your ordinary kitchen into something rustic, rural almost, then walnut will be a good pick. There are more than enough shades to choose from: they start from light brown all the way up to dark black, or, rather, black chocolate. Usually, people prefer this wood over others when they’re looking to add warmth to the interior. For some reason, many folks believe that walnut is cheap, but it isn’t. At the same time, thanks to the ever-growing competition in the industry, you can get this material for a relatively affordable price-tag. Back in the day, only wealthy folks could afford walnut, and it was used to cover wine cellars, libraries, and other “rich white folks” places. 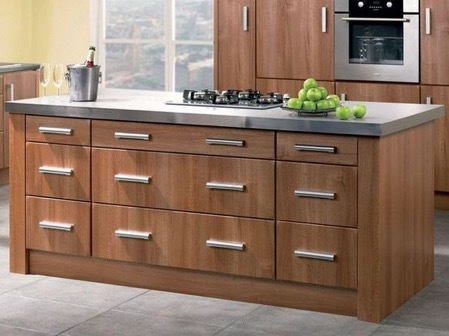 And while these days, you can find walnut doors, tables, chairs, and even floors, in this article, our focus is on walnut kitchen cabinets and the best ways you can use this material to change your kitchen for the better. Walnut looks absolutely amazing; the grain patterns indicate that this wood is of the highest quality (you won’t find similar patterns in less expensive wood). One could say that in the 21st century, walnut is slowly, but steadily becoming the most popular and cost-effective solution for kitchen cabinets. Obviously, no material out there is perfect – the same goes for walnut. So, let us go ahead and take a closer look at the disadvantages that you’ll have to take into consideration. It’s always better to know in advance what to expect from it rather than to be forced to return your cabinets and try to get your money back. Now, we did say that walnut is significantly cheaper these days that it used to be. And while that’s still true, compared to, say, birch, or pine, it is considerably more expensive, and that can (and often is) a big turn-off for the potential buyers. First of all, that’s because it’s harder to obtain this wood; secondly, it takes more fine-tuning to get it into a proper shape. On the bright side, as we already learned today, walnut is always unique and lasts for a very long time, which can actually be a money-savior in the long run. A great alternative could be an engineered wood with a walnut cover that will make the kitchen cabinets look like the real thing. They won’t be as durable, but at least you’ll get to enjoy the elegant look of this expensive material. That’s pretty much it for the disadvantages of choosing walnut kitchen cabinets. Walnut can be combined with a wide variety of different materials and always brings harmony into the kitchen, and this is a huge plus. You can either go with a one-color scheme for the walnut, or use another popular approach – the two-tone technique, meaning a combination of two different colors (or, rather, tones). As you can see, we’re big fans of both uses and have collected the best examples for you to check out. A quick note: don’t listen to people claiming that it’s hard to clear the dust off a walnut cabinet – on the contrary, they are quite easy to keep clean and won’t cause you any trouble. Along with maple, walnut is considered to be top-of-the-line wood species, and even if you add two or three cabinets in your kitchen, they will change the entire atmosphere. We already talked about the various patterns and colors that are common for this wood. And while there are some examples of owners introducing several different wood materials to their rooms (especially the kitchen), it would be a good idea to stick to the rules and use only one material. There are more than enough variations with walnut alone as it is; so, make life easier for yourself and don’t go crazy. Alright, now that we have the basics out of the way, it is time to get right to it – the best walnut kitchen cabinets ideas for 2018. The Internet is full of all kinds of crazy combinations; still, our policy here is to go with the classics and be more conservative. One last thing before we get to it: even though walnut admits stain, don’t expect it to change 180 degrees after you cover it. That rich, dark, beautiful color will always stay there, regardless of whether you use stain or not. Please, keep that in mind so that there’s no disappointment. We could include this in the Cons chapter, but for some people, this is actually a huge plus. 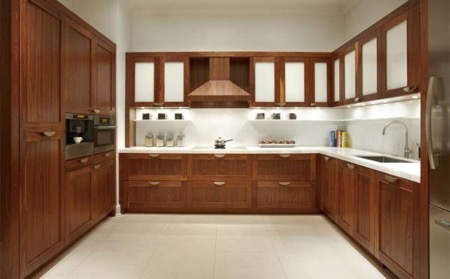 Ok, we are finally ready to give you some good-looking examples of walnut kitchen cabinets. We’ve got 21 in total, and they are all equally intriguing. We’ve got black, brown, natural, and even creamy walnut at your disposal. A quick tip: apply every single idea to your own kitchen in your mind to see whether it goes hand in hand with your own expectations or not. What we have here is black walnut, and it looks quite lovely. As we mentioned several times during the article, one of the best qualities of this wood is the fact that it is equally qualified to be the leader and the follower. What we mean by that is that in this case, the cabinets are in the center of the attention. Yet, the fridge, the floor, the window, and the white walls are also a part of the picture. Another thing that we want to point out: the cabinets look and feel very vintage, especially with those 50s-style handles. See the chairs and the table on the right? They fit the overall atmosphere perfectly, creating a calm, warm, and relaxing vibe for the kitchen. 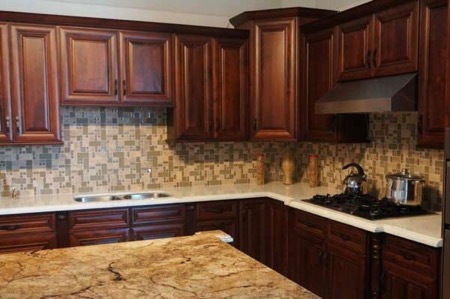 Here, we’ve got a completely different picture, even though the overall style of the cabinets is very similar. First of all, there’s a lot of light coming into the room from the windows, which is exactly why the walnut is light brown, not dark black like in the previous example. You need to always take into consideration the amount of natural light that’s gonna be there for the better half of the day. The floor and the sofa are light grey, going hand in hand with the rest. You can always go with a different design of the cabinets – something more modern, or, alternatively, a more classic approach. But this is a great start and is, again, not in the center of attention. If you’re not a fan of “hard turns”, it might be a wise idea to go with something average in terms of color choice. The red/brown looks great with the furniture in the back, creating a full picture. Thanks to the high quality of the wood, you can stick with this setup for many years (or even decades). Did you notice that there are no handles? This creates an even bigger retro vibe and lets the eyes enjoy the view without any distracting elements. Every single cabinet serves its purpose, and this should be more than enough for an average-sized family. Sure, you can always go for more, but that might ruin the perfect balance of things. It doesn’t get any more rustic and rural than this. You can clearly see the unique wood patterns on every single drawer, and with the window and the door lighting the room up, this seems like the best choice. People that appreciate raw cabinets with little to no stain and that natural wood color should definitely take this setup into consideration. 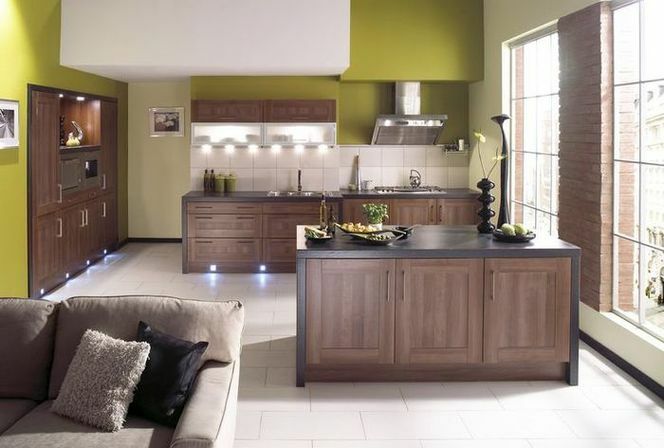 Compared to all the previous walnut kitchen cabinets ideas, we have a very minimalistic approach here. 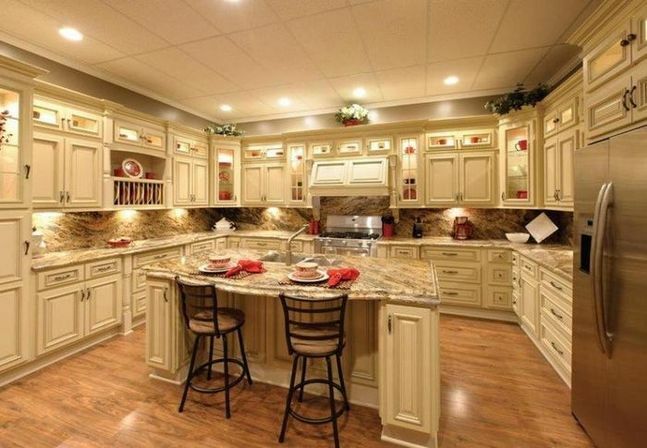 If you’ve got a big, happy family, then the lack of cabinets might be a turn-off. If not, well, get ready to bring light and bright colors into your kitchen! The color is brown, and the cabinets are just as retro as in all the previous examples because that’s just what walnut is great at. But in this case, there’s a very clever use of the space in the room. The two cabinets on the right “hug” the one and only window. The fridge, in turn, is surrounded by even more cabinets. First of all, that looks pretty cool, as we have a combination of vintage with modern in our kitchen. Secondly, it’s all there, right in front of you, and there’s no need to move away from the cabinets to get what you want. The table in the middle can be used to cut, chop, and mix whatever ingredients you’ve got at home. This one is for the younger generations that aren’t really into vintage things. Here, we’ve got a very modern approach to design, and, surprisingly enough (at least, for the average man and woman), the light-brown walnut cabinets fit perfectly. The floor and the fridge are grey; the left wall and the ceiling are white (the color of milk, to be exact). 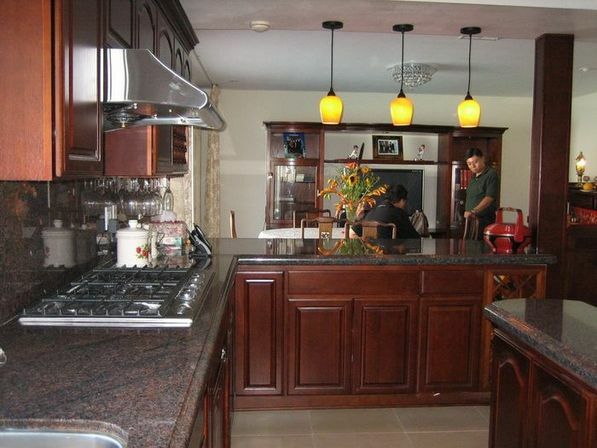 However, thanks to the other two walls, the cabinets add harmony to the kitchen, instead of creating a big mess. The longer, more modernized design and the emphasis on the natural qualities of the wood are also clever decisions. Don’t tell us you don’t want something like that in your house! The designers are calling this the average housewife’s best friend. There’s nothing out of the ordinary, no fancy designs. What we do have is a very neat and useful setup for a regular family’s daily life. 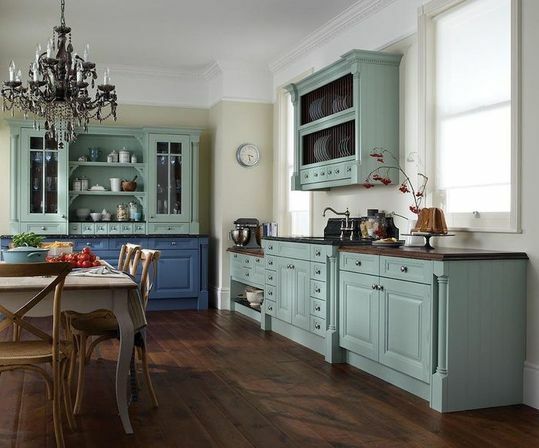 Interesting fact: this color and overall style of the cabinets used to be incredibly popular in the USSR (and still is in modern-day Russia). 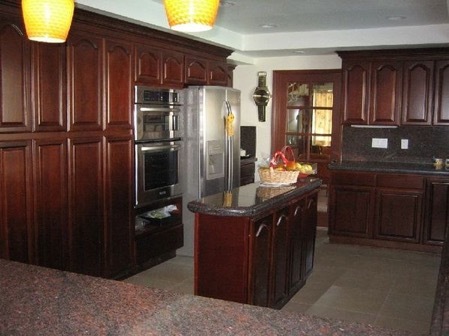 In the middle, you’ve got the gas stove; the cover of the cabinets is standard for this type of wood. The best thing about the cover is the fact that it is incredibly easy to clean and it will serve for a very long time. One more thing: notice how to cabinets are cutting the room into two separate parts? Alright, here, we’re dealing with a very light, white on white design. You can even use the table in the middle for having a quick bite. The fridge isn’t covered by the wood; the same goes for the stove. The rest is all white, or, rather, cream, and it goes great with the ceiling and the floor. The floor is also made of wood, which matches the walnut splendidly. 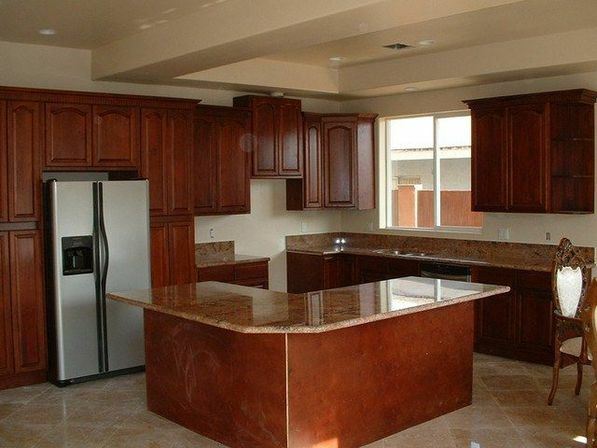 From afar, you wouldn’t even say that this is actually walnut on the cabinets, since it looks like a different material. This example proves that walnut is a very flexible wood and can be used in more combinations and color patterns than people think. Oh, and yes, there are more cabinets than you’ll ever need. Looking for that now-classic design with the stove in the middle of the room? Then check out or next pick. This cabinet idea involves all-walnut cabinets and a walnut cover for the fridge. Most of the kitchen stuff is hidden in the table – you’ve got 9 drawers in total. Back in the day, this wasn’t a very common design; but these days, thanks to the great looks and clever planning, it is becoming more and more popular. The biggest reason – you get more space in the room and can approach the table from all four sides. The table is still very close to the cabinets and everything is within reach. We have a hotel-style setup right here. It’s not nearly as fancy as most of the designs that we’ve already gone through, but it is quite alright in terms of “cheap-yet-useful.” You don’t need tons of cabinets in the daily routine, anyway. The stove isn’t even in the picture; the same goes for the fridge. Interesting fact: most couples that think about a redesign in the kitchen put this idea in the top-3 possible picks. It’s equally affordable and comfortable. Furthermore, there’s no need for careful planning, meaning this setup works in almost every single kitchen in any corner of the planet. And you can always change the color if you don’t like it. This design is like a combination of all the previous ones with some “fine-tuning” here and there. The table is sitting right in the middle, and it’s a lot smaller. A big family won’t be able to have a nice dinner around it (simply because it’s too small), but, again, there’s more space to walk around in the kitchen. See the door in the far corner? It’s made of walnut, just like the cabinets. And when all these separate elements come together, they create a wonderful atmosphere. The extra-long cabinets on the left are very 18th-century England. The stove and the fridge “incorporated” in the right, in turn, help keep the balance between vintage and modern. This kitchen looks equally warm and relaxing both at night and during the day. The room is pretty big, and you can enjoy the view out of that window while cooking a nice meal or doing the dishes. 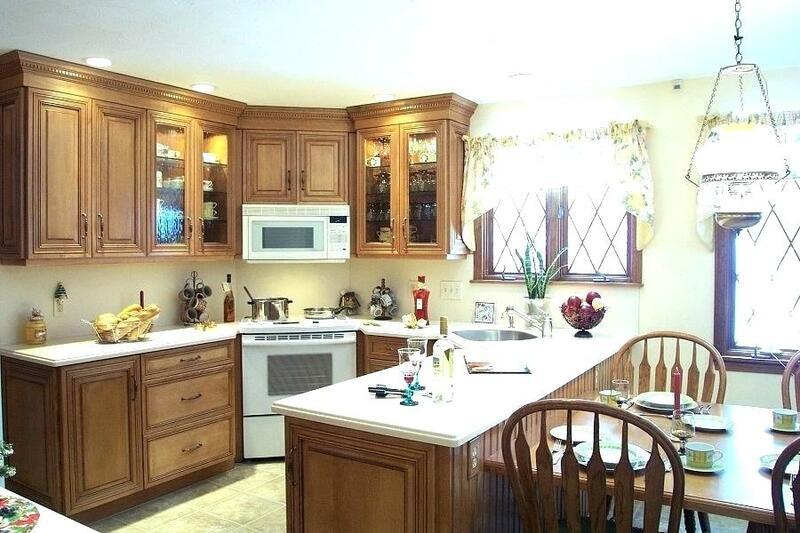 The cabinets aren’t exactly fancy and look like they belong to the owner’s grandparents. But that’s the beauty of walnut, so, we’ll take it as a pro, not a con. The beautiful tiny light bulbs all over the ceiling certainly do add a nice touch. The sink can be moved closer to the stove so that there’s more space on the table – it all depends on your preferences. One thing is certain: this design won’t cost you much but will still look very expensive, which is exactly what a lot of people aim at. What’s the biggest difference between this design and the previous one? The first thing that catches the eye is the slightly lighter color. Then, the covers on the table and the cabinets on the right are black. And, of course, there are additional cabinets on the right. 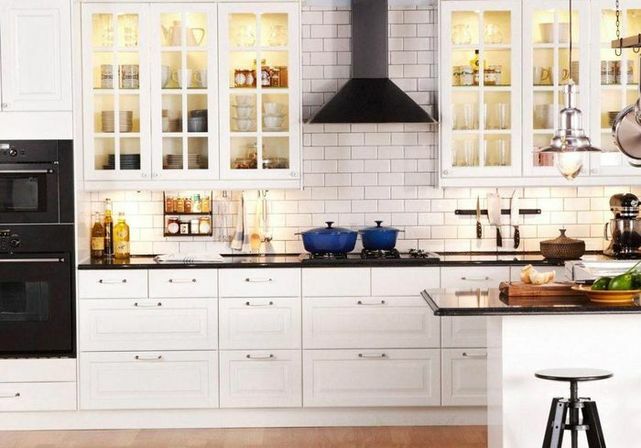 As we already said several times in this post, it depends on what you want for your kitchen (and the budget for it). Most people don’t have a need in more cabinets that the ones that you see in front of the table. The light walnut looks marvelous with the white floor, ceiling, and chairs. The rest is pretty standard. The microwave is a nice touch as well, especially since there is no stove in this particular design. Ok, now we’re finally ready to check out black walnut cabinets. These are all-time classics and will never get old. 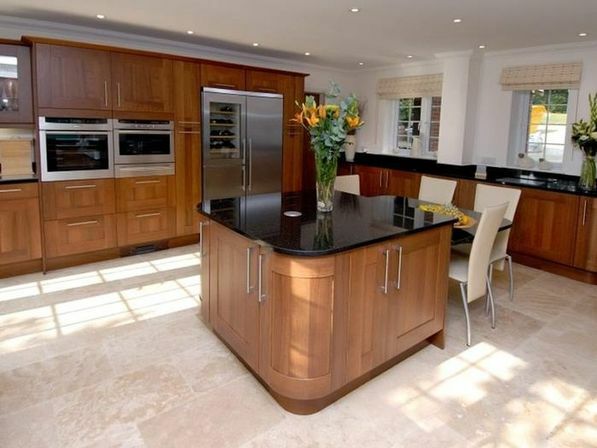 You can instantly see that they scream royal status and will turn even the most average room into an A-class kitchen. 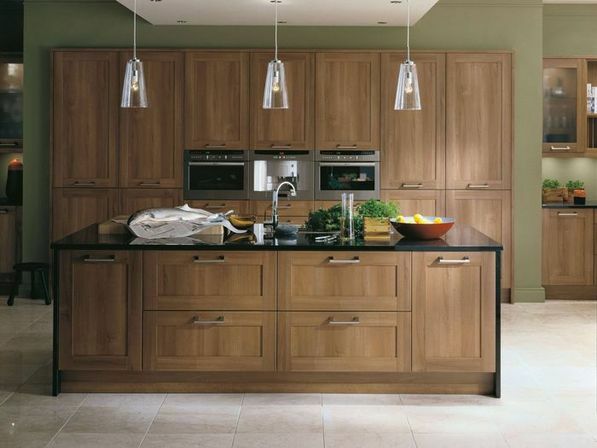 The overall tone of the kitchen is very serene and peaceful and looks especially good when it gets dark outside. The stylish “columns” on the table, the long, unique lights, and the sterile walls/floor/ceiling let the cabinets shine through. Walnut sure does go great with alder (yes, there’s a little bit of both on the picture), but walnut is, obviously, the more prominent material. In case you were wondering, there’s no need for the entire kitchen to be covered in walnut. 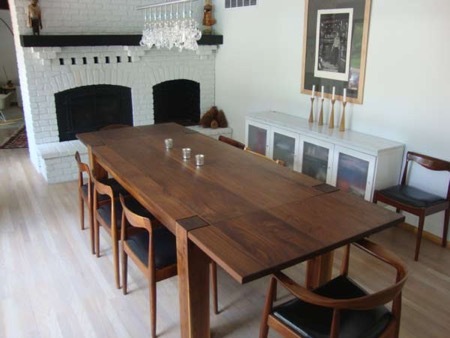 You can go with different materials for the cabinets, the walls, and the doors, but still choose a walnut kitchen table. Like any other piece of furniture, a walnut table will look great. There are numerous designs when it comes to this. We’ve picked the most common, affordable, and comfortable one on the market right now. Make sure to scroll through as many as possible, because once you stick with one table, it will pretty much define your kitchen. If you’re on a budget, you can always choose a cheaper wood, like birch. 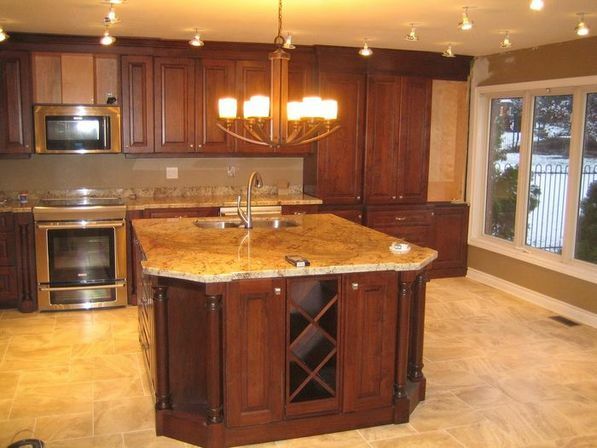 When going with walnut kitchen cabinets modern should always be on your mind. This exactly example is an ideal combination of both worlds – Retro and Modern. This reminds us a bit of a laboratory or a science testing room from the 80s movies. But it will only take you a couple of hours to get used to the high-quality materials, the smart design, and everything else in between. In 2018, even the entry-level companies can offer you tons of variations; so, just like with the table, let them show their best options and only then make your choice. The example you see in the photograph is balanced out and will find its way into the average kitchen. The best thing about this setup is, of course, the color of the walnut. It is perfect for this room and resembles old-school libraries from the 70s. The natural texture of the wood is lovely; the design, in turn, makes great use of the environment. The doors on both sides might be a problem, but with this setup, you can freely roam through the kitchen and everything will be within hand’s rich. 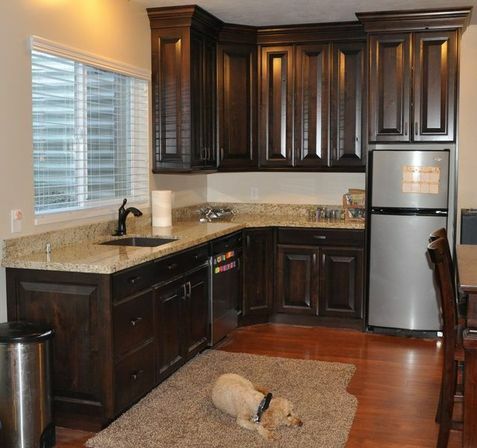 The fridge is hidden behind dark walnut kitchen cabinets so that it doesn’t attract attention. The main idea of this design – the cabinets are the leaders; the rest is just there. The cover of the table is very reflective and will be easy to clean. 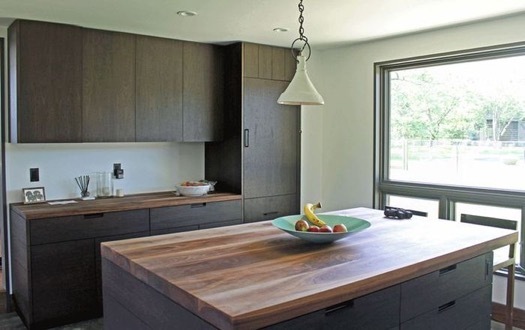 Natural walnut kitchen cabinets are the next big thing these days. 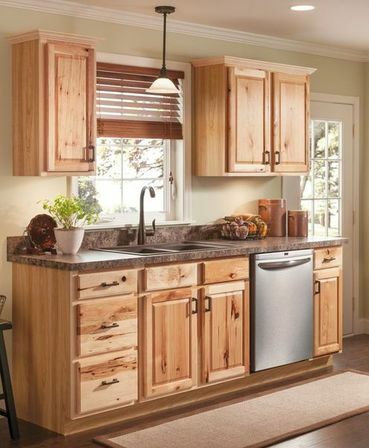 They used to be popular in the early 2000s; then, stained cabinets took over the market. Now, they are back on top. The most obvious pro of natural walnut is the fact that the raw wood patterns turn a boring environment into an exciting one. You can already see those unique patterns, especially on the left side. But you’ll get to really appreciate that when standing right in front of the cabinets. As for the design, it allows the owner to separate the kitchen from the rest of the room, thus creating the illusion of it being on its own. It feels like you’re entering the kitchen without even opening a door. American walnut, native to North America (the eastern parts, to be exact), comes with a beautiful, straight-grained timber. It’s not rare for it to also feature some curly grains, though. We’ll say it again: every single tree on planet Earth is unique, and the American walnut is not an exception. That means there are numerous texture, grain, and color combinations. Therefore, you should always see everything with your own eyes before paying for the cabinets. 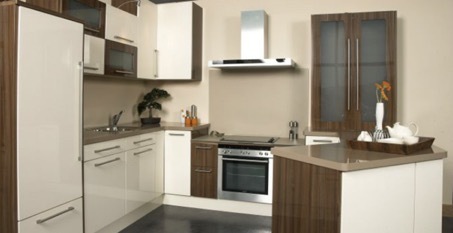 The American walnut kitchen cabinets have a very attractive gloss that looks lovely when the light is right. The design here is not at all unique: it appeals to a wide range of potential customers. 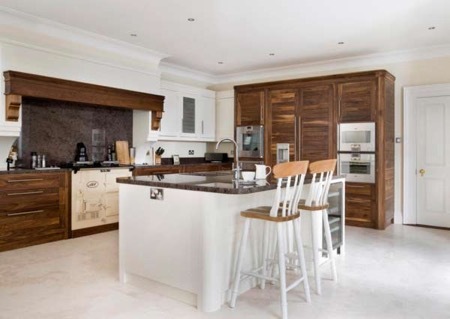 For some people, any cream walnut kitchen will look cheap no matter what you do. For others, it is exactly what they need. In 2018, this color is trendy not only in the US, but also in Europe. If you’ve got a relatively small kitchen, this “tight” design might be exactly what you’re looking for. The table on the right serves as some sort of a divider, separating that part of the kitchen from the rest. As you can see, the side of the table and the cabinet next to the stove are natural brown; the same goes for the window, the left side of the fried, and some other cabinets. That creates a majestic combination for our kitchen. The walls are also creamy, but a bit duller. We have another creamy kitchen for you. Again, there’s a combination of cream and natural walnut, only this time around, the room is significantly bigger and there’s more natural walnut with rough, raw textures. The chairs, in turn, are 80% white, which creates an eye-catching picture. This kitchen looks a bit like it “escaped” from the 19th century, and that’s exactly what the designer was going for.